In October 2007 MediaArtLab opens the Media Museum. This is an absolutely new kind of a museum — a laboratory to generate new creative ideas combined with a library, cinema and exhibition space. A contemporary artwork is a complex organism it is impossible to study through illustrations only. The audience has to watch it in movement and in space, to hear it work and to get an exhaustive commentary on its context. Introducing media art works into museum space means not only their technical preservation but also work with the environment of their representation. In this aspect the theatre is media culture’s paradise. In the theatre media history has actually began for it is here that message virtualization technologies have developed for centuries. Afterwards these new reproduction technologies have made theatre itself virtual, turning it into cinema. As the final evolutionary stage cinematograph comes back to theatre to look at itself from a different perspective. During two nights at the Theatre of Nations the audience will be introduced to a range of films reflecting the process, and also contemporary plastic performances, a synthesis of dance and media context. These performances reduce media to stage props and decompose it using performative artistic strategies. The program researches contemporary post technological media history which is closely connected with contemporary methods of artistic, musical, plastic, visual and technological expression. 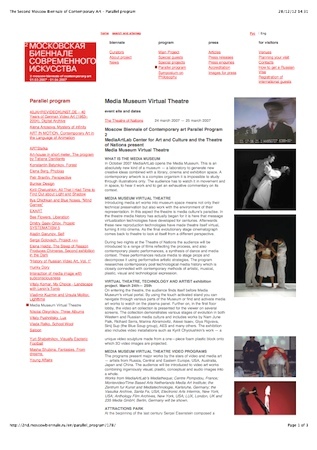 “THE SECOND MOSCOW BIENNALE OF CONTEMPORARY ART - PARALLEL PROGRAM Media Museum Virtual Theatre ,” Pierre Yves Clouin, accessed April 23, 2019, http://pierreyvesclouin.fr/items/show/123.